Corner of Hennepin Ave. and N. 17th Street in Minneapolis, Minnesota. Hours subject to change based on scheduled activities and holidays. 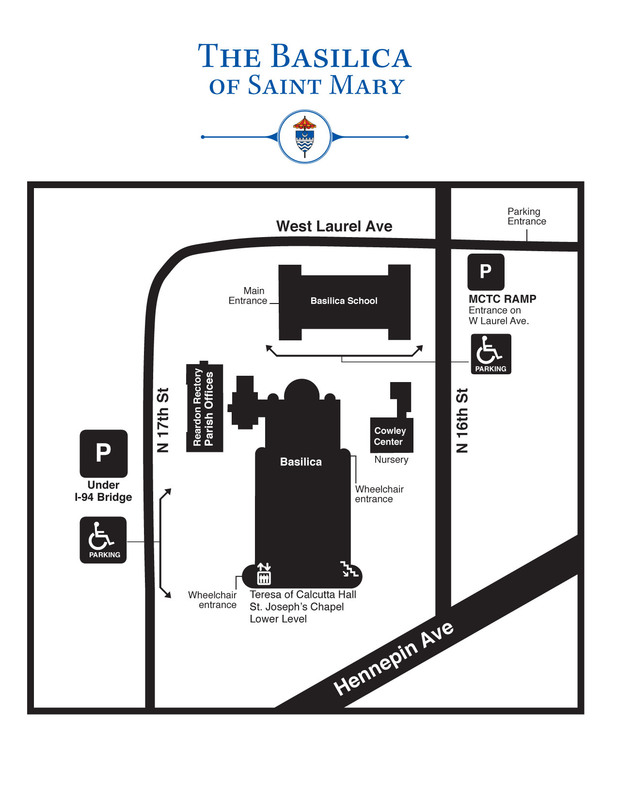 Download/View a map of the Basilica campus. East side of the church on N. 16th St. Reserved for Handicapped Parking Only on weekends. North of the church on W. Laurel Ave.
Bike to The Basilica using this route map. Find a bus route using the MTC Trip Planner. From the east via I-94: Take the Hennepin/Lyndale exit (Exit 231B). Go North (right) on Lyndale/Hennepin and continue North on Hennepin to N 17th Street. : Take the LyndaleAvenue exit (Exit 231A) toward Hennepin. Turn Left onto Dunwoody Blvd. From the west via I-394: Take the Dunwoody Blvd exit (Exit 8A). Go East (right) on Dunwoody Blvd. to N 17thStreet. From the south via I-35W: Follow the I-94West exit (Exit 17B). Go North (right) on Lyndale/Hennepin and North on Hennepin to N 17th Street. Take I-94 West exit (Exit 17B).